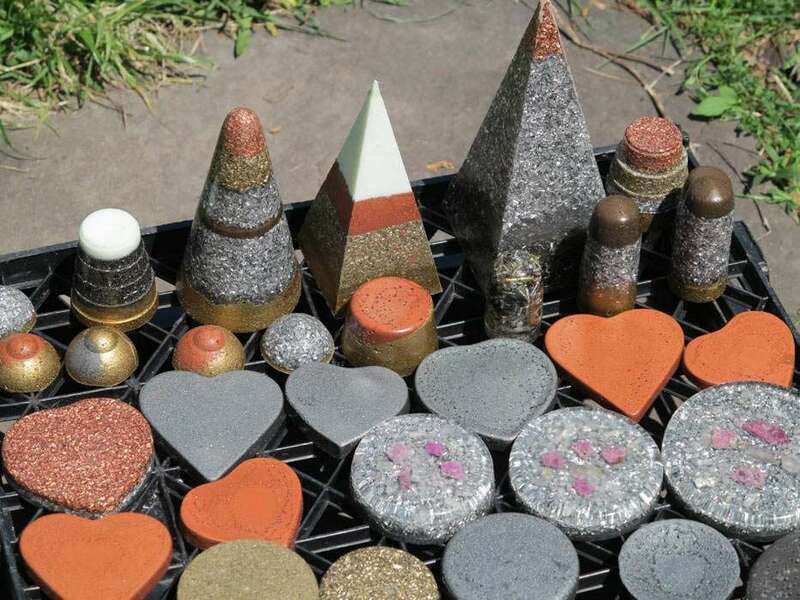 Artistic Orgonite Tools for sale by Dirk Gillabel. Orgite is my own term for what is commonly known as orgonite. "I received your disk in the mail. Wooooooow what a powerful disk this is. It fills up my whole house with energy, this actually does work. When I opened up my mail box that day, I felt it. Never thought it would be this powerful!! Orgite is amazing..... Rene "
"I felt the energy when I got close to the mailbox! I will let you know how its working, I already am loving it! Can't wait to order more. Regards, Karen "
Write me an email ( suncreations@earthlink.net ), and write down the code# (for example, Pendant#21) for the items you want, with your shipping address. I will then calculate shipping costs, and send you a PayPal invoice. I also accept checks and postal money orders. I ship only to customers in the USA; no international shipping. I can only ship to the address on your PayPal account! Sometimes people move and forget the change their address in their PayPal account. Please check that your shipping address is the same as the one on your PayPal account. Easy answers on my Orgite FAQ page. The Orgite I make is intended for spiritual healing, and for energy work on yourself and your immediate environment. Orgite is my own term for what is commonly called Orgite. At the top left of this page are links to the Orgite products I have for sale. I put my emphasis on Orgite products that work. This means that they contain enough metal shavings and/or powder to maximize the effect. I have seen Orgite products for sale, with very little shavings and some crystals and wire coils to make it attractive, but they are not going to be as effective. For me, the decorative aspect is secondary. My orgonite products still look good, but they might have slight imperfections, because casting with resin is more of an art and less predictable than a factory process.